The ABMI’s Application Centre develops products and services that build on ABMI’s core capacity to monitor long-term broad-scale changes in biodiversity. These applications enhance the relevance of the ABMI, and support new and continued investments in research by both collaborators and program sponsors. In October 2013, the ABMI held its inaugural public speaker series forum titled “Better Environmental Management Through Monitoring”, organized by Delinda Ryerson, Project Manager in the Application Centre. With CBC’s Peter Brown as forum moderator, over 230 attendees from industry, government, non-governmental organizations, academia, and the public learned about the important roles of the ABMI in supporting enhanced environmental management throughout Alberta. The forum began with an introduction to the ABMI by Executive Director Kirk Andries, followed by Jim Herbers, Information Centre Director, who spoke about the important role the ABMI plays in Alberta’s Biodiversity Management Framework. Next up Dr. Dan Farr, Director of the Application Centre, provided an overview of the Application Centre and introduced the four projects highlighted by the forum. How will Alberta’s biodiversity and ecosystems respond to climate change? The ABMI is leading a collaborative Biodiversity Management and Climate Change Adaptation project that is developing essential knowledge and tools to support the management of Alberta’s biodiversity in a changing climate. We are using the ABMI’s biodiversity database, ecological models, and new experiments to help answer this question, and provide tools to manage biodiversity into the future. Dr. Rick Schneider, a project collaborator, shared some key take-home messages from the ABMI’s newly published report on Alberta’s Natural Subregions Under a Changing Climate: Past, Present, and Future during his presentation. Dr. Schneider was followed by Dr. Erin Bayne, University of Alberta Professor and project collaborator, who discussed the value of the ABMI for forecasting the future of Alberta’s birds in a changing climate. The ABMI is developing an integrated, scientifically robust and financially sustainable monitoring program to assess recovery of physical, chemical, and biological indicators at certified reclaimed industrial sites across Alberta. The program is currently measuring recovery on reclaimed wellsites, and Dr. Anne McIntosh, ABMI Ecologist, highlighted progress to date, including sampling of grasslands using newly-developed monitoring protocols that are compatible with the ABMI’s core monitoring system. Dr. McIntosh was followed by Bonnie Drozdowski, Reclamation Program Leader at Alberta Innovates – Technology Futures, who described the conceptual framework used to select soil indicators. The rapid expansion of oil sands development in northeastern Alberta has shone a spotlight on environmental assessment and monitoring. On top of the ABMI’s long-term biodiversity monitoring network throughout the province, the ABMI is designing specialized protocols to monitor rare plants and animals in this region of special interest. This research is being conducted in partnership with a committee of government and industry representatives to ensure maximum impact on environmental management. Dr. Rob Serrouya, ABMI Caribou Scientist, described the ongoing challenges to monitoring the recovery of threatened woodland caribou in northeastern Alberta. Next up, Dr. Scott Nielsen, University of Alberta Professor and EMCLA collaborator, highlighted novel monitoring methods that will ensure that rare plant species are effectively monitored and are considered in regional land-use planning efforts. Ecosystem services are the benefits provided by natural systems that contribute to human well-being. The ABMI is leading the development of a series of integrated models to represent ecosystem service supply and demand across Alberta. This project provides support for market-based approaches and land-use planning initiatives that promote positive environmental outcomes. Mike Kennedy, President of Green Analytics Corp., gave an overview of ongoing efforts centered on modeling water purification in Alberta. In the last talk of the forum, Tom Habib, ABMI Research Coordinator on the Ecosystem Services project, used the oil sands industry of Alberta as a case study to explore the use of alternative conservation offset programs to achieve positive environmental outcomes (article). 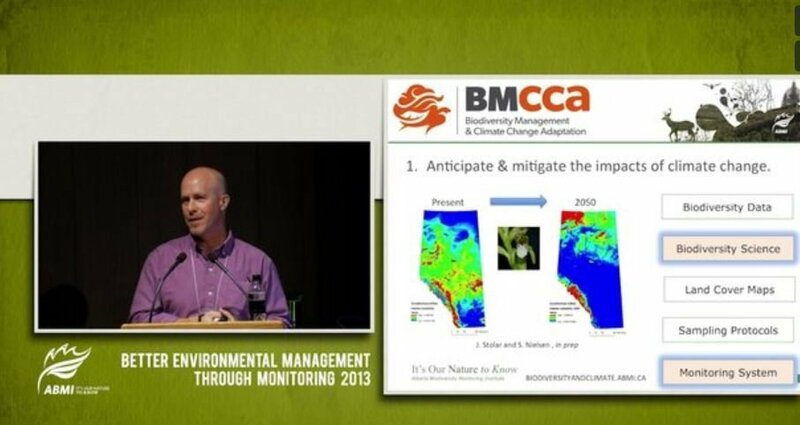 If you missed the forum you can find out what you missed by watching the speaker videos that showcase the ABMI’s activities that are improving environmental management in Alberta: (http://vimeo.com/album/2636038/). We hope to see you at the next Speaker Series Forum!